^ Polmar, Norman. The Naval Institute guide to the ships and aircraft of the U.S. fleet. 美國海軍學會（英语：United States Naval Institute）（Naval Institute）. 2004年: 112頁. ISBN 978-1-59114-685-8. 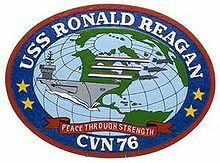 ^ Thousands of US Navy officers arrive in Hong Kong for USS Ronald Reagan port of call. South China Morning Post. 3 October 2017 [18 October 2017].